The Tibetan bridge in Carasc is an unusual destination containing an exciting mixture of nature, culture and adventure. 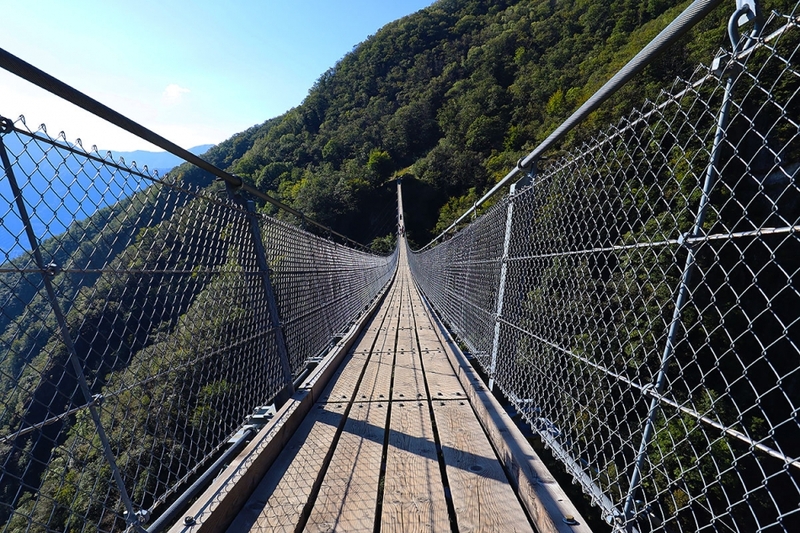 This fascinating 130m high suspended tibetan bridge in Ticino is 270 m long and aprox. 1 mt wide. It not be appropriate for those suffering from fear of heights nor should you visit on days with very strong wind. The fascinating 130m high suspended tibetan bridge of Carasc. We highly recommend you visit the little village of Curzutt on the way there, with its beautiful little Romanesque church, San Bernando. If the church should be closed, you may find the key at the Curzutt hostel which is also an excellent restaurant. The Tibetan bridge at Carasc is free and open all year round. We think it is best done in spring and autumn. It’s best to avoid visiting the bridge during the very hot summer months because of heat and the influx of tourists in July and Augus. We went there in mid-September and it was very pleasant to see autumn colours and to enjoy the bridge with only a few others. 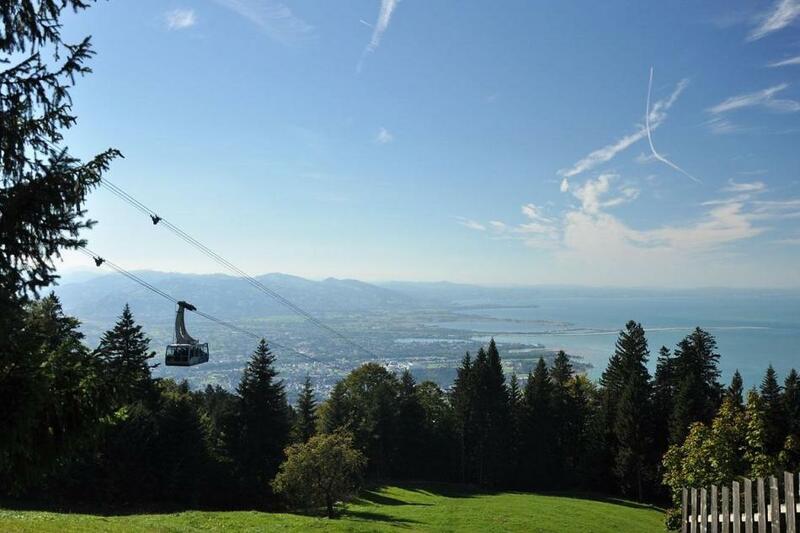 The Monte Carasso cable car – Mornera is tiny and can transport no more than 8 people at a time. To avoid long queues in high season, we suggest you book your ticket online with fixed ascent time. 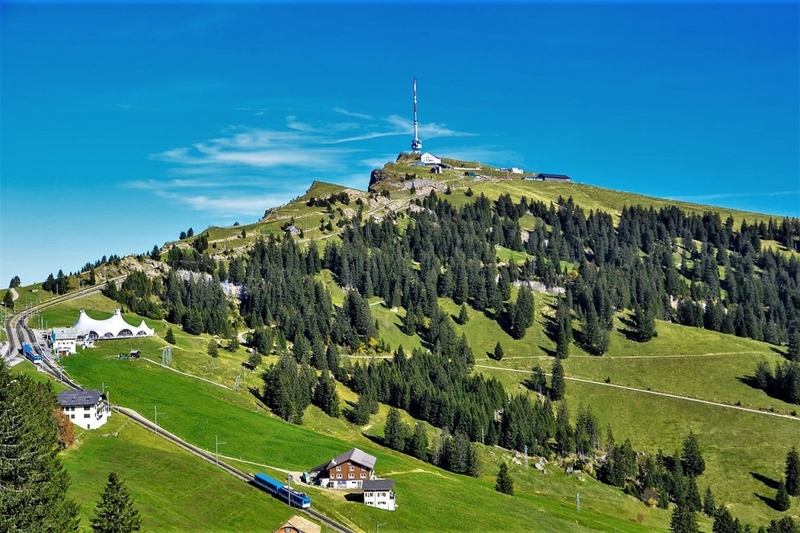 On the way down, you will need to call the cable car by pressing a button inside a locker located on the top of the stairs at the Curzutt cable car station. The Tibetan bridge is protected by a wire mesh protection on both sides, so it is completely safe, even with children. "Roaming through the magnificently restored village of Curzutt and obviously the thrilling walk across the suspended bridge." 1. Take a selfie sitting on the Tibetan bridge. 2. 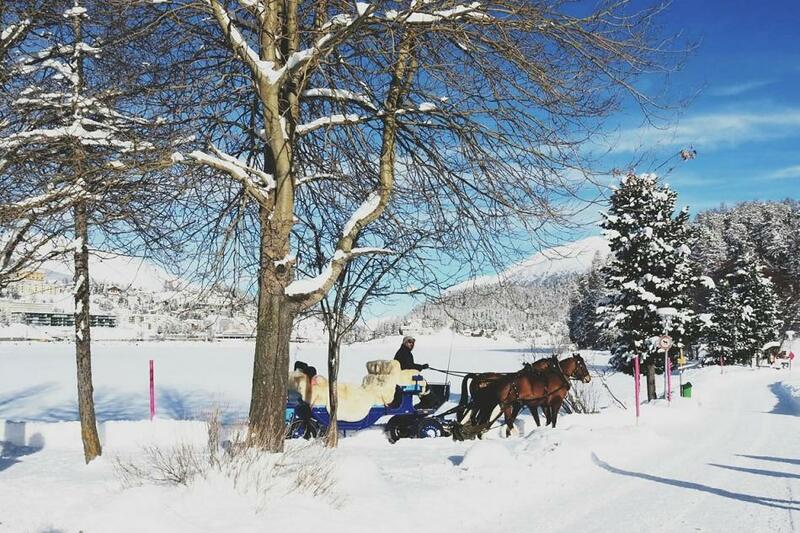 Visit the typical alpine village of Curzutt and the church of San Bernardo. 3. Stroll in the chestnut tree woods and visit the vineyards of Merlot at the bottom of the valley. 2. Take a day trip to the Verzasca valley. 8. Reach the panoramic sanctuary of Madonna del Sasso above Locarno. The Carasc Tibetan Bridge is located above the village of Sementina in the Tessin region. Sementina offers some hotels B&B and holiday houses. 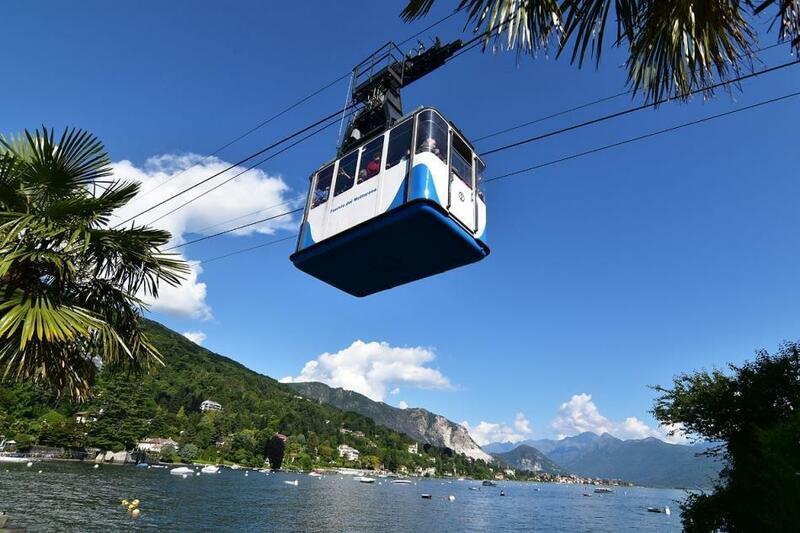 It is possible to find an accomodation in the village or in the panoramic villages of Lake Maggiore. 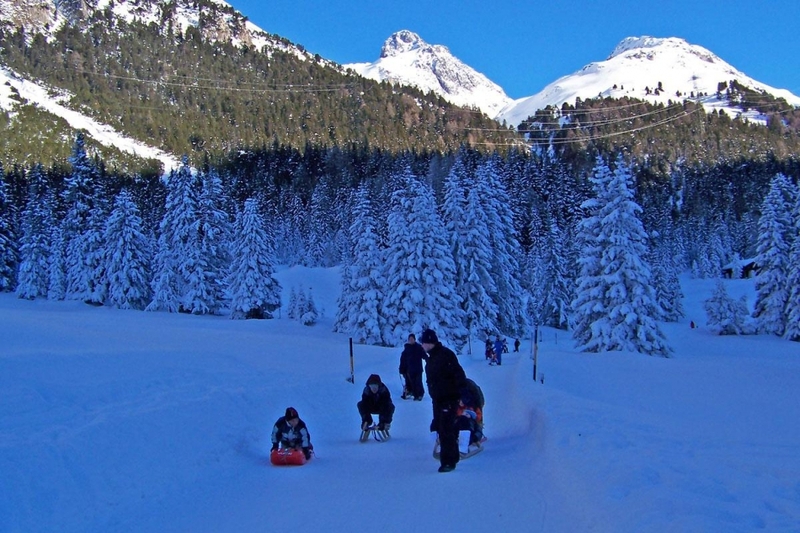 In the small alpine village of Curzutt is possible to sleep in an Hostel: info and booking Hostel in Curzutt. The Carasc bridge, is in the Fra locality, in the hills of Monte Carasso and Sementina, Tessin only a few kilometers from Bellinizona and the Lake Maggiore. For those of you arriving by car, you should know that parking space is limited at the foot of the cable car. We advise you to park at the Monte Carasso town hall (300m from the cable car). There are excellent public transport connections by bus from Bellinzona and Locarno train stations in the Monte Carasso direction. Once you arrive in the town of Monte Carasson, you can choose an easier route or a more difficult one. The first option entails taking the Monte Carasso- Mornera cable car and getting off at the first stop and then continuing on the old mule path for about 45 mins until you get to the Tibetan bridge. The second choice would be to walk up from the cable car station to the Tibetan bridge. Aprox. 1hr 30min. We opted for the shorter solution and we have to admit that the trip in the tiny cable car itself, was well worth the trip. For the more athletic, who would like to go back down using the trail, it is possible when you cross the bridge, take the path in the Sementina direction and go back to point of departure (4 hrs aprox). DO YOU HAVE QUESTIONS OR SUGGESTIONS ABOUT THE CARASC TIBETAN BRIDGE?